The Linksys PLW400 Powerline AV Wireless Network Extender has a web-based setup page that allows you to manually configure it or change its settings. NOTE: This article assumes that you already have the PLW400 installed and the Powerline AV Utility properly configured. If not, click here for instructions on setting up the PLW400. Launch the Powerline AV Utility by clicking Start > All Programs > Powerline AV Utility. NOTE: If you are using a Mac computer, open the Applications folder then double-click the Powerline AV Utility icon. Once the utility opens, click the Wireless Setting tab. Under the Advanced Wireless section, click the link that displays the IP address of the PLW400. 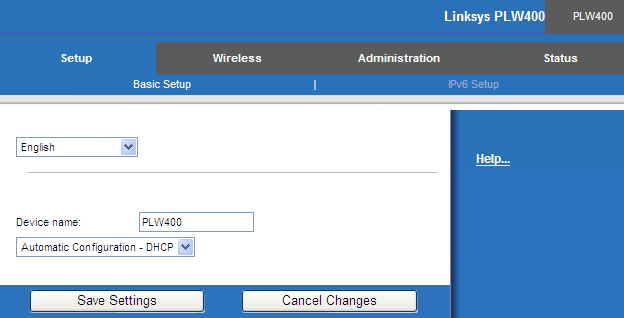 You will then be directed to the web-based setup page of the Linksys PLW400. Open a web browser like Internet Explorer or Safari. NOTE: Make sure you are using a computer that is already connected to the PLW400 through a wired or wireless connection. 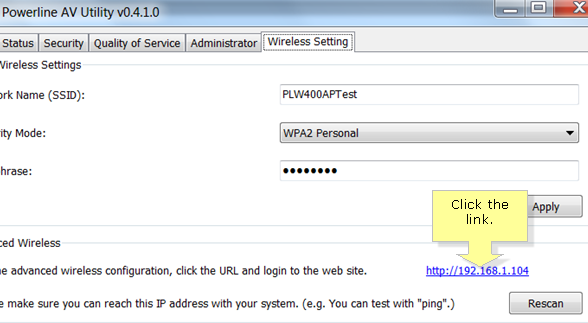 Enter the IP address of the PLW400 on the Address bar. NOTE: The default IP address of the PLW400 is 192.168.1.104. If it does not direct you to the web-based setup page, it means your router has assigned a different IP address to it. Access the web-based setup page of your router and check under the DHCP client table for the correct IP address. To learn how, click here.